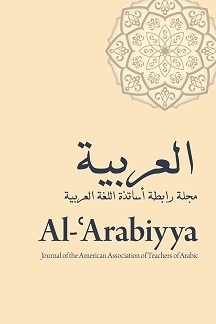 Founded initially as An-Nashra in 1967, Al-cArabiyya is the annual journal of the American Association of Teachers of Arabic, serving scholars in the U.S. and abroad. Al-cArabiyya publishes scholarly and pedagogical articles and reviews which contribute to the advancement of study, criticism, research and teaching in the fields of Arabic language, literature and linguistics. Occasionally, translations of important Arabic texts are published. Articles are submitted both by AATA members and others interested in submitting papers. A subscription to the journal is included in an annual association membership, the cost of which is $50 US for individuals, $15 US for students, and $200 US for institutions. To join AATA, click here. An annual subscription (one volume) to the journal is available to individuals and institutions from the publisher, Georgetown University Press for $60 US. Check with your institution's library to see if it subscribes. Back issues of volumes 44-45 to the present can be purchased from the Georgetown University Press website. Back issues of volumes 47 to the current issue of the journal are also available online from Project MUSE. Back issues of volumes 1-48 (as well as those of An-Nashra) are available online from JStor. To request permission to use all or part of an article in another publication, please contact the following. Include in your email: title and author of the article, volume in which it appears, what you wish to include in another publication, and in what publication it would appear. General: Al-cArabiyya, a leading journal in the field of Arabic language and linguistics, welcomes scholarly and pedagogical articles, as well as reviews which contribute to the advancement of study, criticism, research, and teaching in the fields of Arabic language, linguistics, and literature. Authors are encouraged to present an original, scholarly contribution, a perceptive restructuring of existing knowledge, or a discussion of an idea with information and references on how to learn more about the topic. References should be appropriately and sufficiently extensive and demonstrative of comprehensive awareness of international scholarship; the conclusions drawn should be accurate, appropriately documented, and soundly argued, without being overextended. The overall length of the article should be appropriate to the material treated and should not exceed 8000 words (in Times New Roman, 12 pt. ); the material should be well-organized and the writing style fluent and professional. Articles in Arabic are welcome. We respectfully request that authors writing in a language other than their native language have their contribution carefully checked by a native speaker before submission. Do not submit a piece that has been published elsewhere or is being considered for publication elsewhere. Authors alone are responsible for the opinions they express and for the accuracy of facts presented in their articles. The journal also welcomes translations and bibliographies, provided they meet the following guidelines: translations should be scholarly, accompanied by an introduction or critical essay, annotations, commentaries, etc. Bibliographies should also be annotated, critical, and accompanied by an appropriate introduction. Translations and bibliographies are subject to the same review process as articles. Submission: Manuscripts should be submitted in duplicate, whether in hard copy or electronic format. For electronic submission (e.g., by email attachment), please attach both a PDF version and the original file (e.g., an MS Word document). For hard copy submission, all copies must be typed or printed on 8–1/2 x 11 inch or A4 paper, on one side only, double-spaced throughout. Leave at least one-inch margins on all four sides. Number the pages in the upper right-hand corner. The author’s identity should not be revealed in the manuscript or electronic files; instead, a cover sheet or the body of the email message should include: the author’s name, address (post and email), telephone number, academic affiliation, and the title of the article. Articles will not be returned to contributors. An electronic copy is normally required if a hard copy manuscript is accepted for publication. An abstract in English of approximately 100 to 150 words should appear at the beginning of the article to be followed by 7-10 Key words relevant to the content of the article. Typeface: Use italics only for cited linguistic forms, for titles of books and journals, and for subsection headings. Endnotes: Wherever possible, limit use of endnotes to simple and brief statements. Do not use footnotes and do not use endnotes for citing references. To cite references, use in-text citations (see “References” below). Cited forms: Cited forms (letters, morphemes, words, phrases, or sentences) should appear in italics, e.g. the prefix bi-, the word dars. Italics are not used for forms marked as being in phonemic or phonetic transcription, e.g. /sabt/, [sapt]. The meaning of cited forms should appear in quotation marks with no comma before it, e.g. walad "boy." References: Full citation of references should be given at the end of an article. Within the text give the author’s surname, year of publication, and page number(s), where relevant, e.g. Said (1978:31). Such citations should be given in the body of the text, unless they refer specifically to a statement made in an endnote. Barlow, Michael, and Charles A. Ferguson, eds. 1988. Agreement in Natural Language: Approaches, theories, descriptions. Stanford: Center for the Study of Language and Information. conversation. In Contributions to Arabic Linguistics, Charles Ferguson (ed. ), 79–161. Cambridge, Mass. : Harvard University Press. Blau, Joshua. 1977. The Beginning of the Arabic Diglossia: A study of the origin of Neo-Arabic. Transliteration/Transcription. Use an accepted or conventional system for transliteration or transcription, as appropriate, and use it consistently. If you use transliteration with any special characters, such as ħ or š, please use Doulos SIL font for each word of transliteration (free download: http://scripts.sil.org/cms/scripts/page.php?item_id=DoulosSIL_download). Proofs and copies: Proofs of accepted manuscripts will typically be sent to the author(s) for careful review, with the response deadline indicated. Proofreading is the author’s responsibility. No extensive alterations are possible once a manuscript has been accepted for publication. Authors are responsible for obtaining written permission from the copyright holder to quote extracts or to translate a work, and for forwarding a copy of this permission to the editor. The author (or lead author) of an article or book review receives one copy of the issue in which the contribution is published. Submission dates: Manuscripts are accepted on a rolling basis.